Since launching a new Lower Manhattan website in the spring we’ve been itching to make use of their great events and mapping data on the mobile platform. The result is the new Downtown NYC iPhone app released in the App Store on August 25th. We made it a goal to keep the app easy-to-use with a clean interface so the user can find something that interests them in seconds. Events are divided into 13+ categories with new categories and events easily added to the app by the Downtown Alliance staff through the same interface as they use to manage the website content. There is always a featured event on the home screen and with the tenth anniversary of 9/11 approaching the Alliance has created a special category with 25 events. The series starts with an exhibit at the Trinity Museum that opens on September 5th. The Alliance team also used the app to post real-time information for residents during Hurricane Irene. Other Features include event descriptions with images, viewing of all events on a fully integrated Google map, Twitter and Facebook integration and ability to add events to your calendar through iCal. The app also has a Where to Go section that links out to the Downtown NY website listings for Dining, Entertainment, Hotels and many others categories. Since release the app has garnered very favorable reviews and currently has a 5-Star rating. We’ll be working with the Alliance on future releases and continue to focus on providing valuable content through a clean, easy-to-use interface. 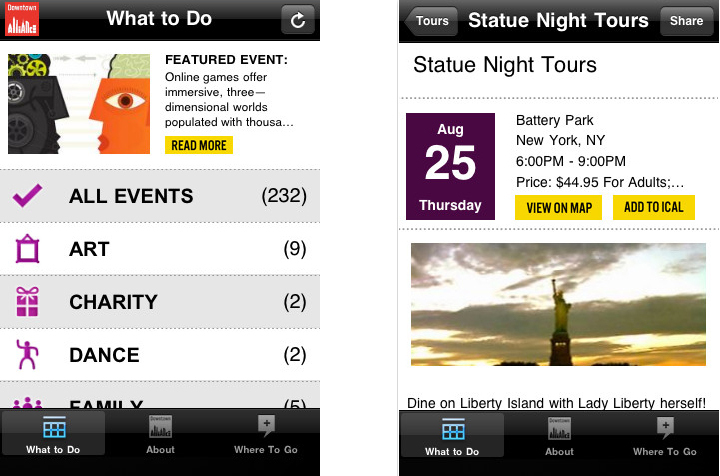 Download the Downtown NYC App today from the App Store and discover Everything Happening in Lower Manhattan!